When Rafael Nadal steps on to the Court Rainier III on Wednesday for his Round of 32 match at the Rolex Monte Carlo Masters, his eyes will be firmly set on achieving an unprecedented 12th title and 4th in succession at the Principality of Monaco. 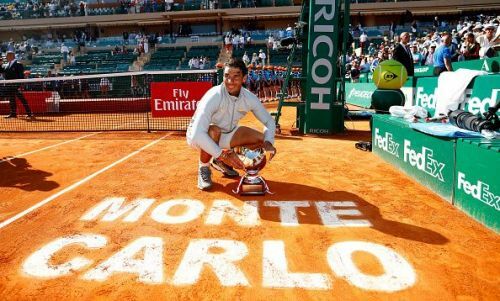 Just as Nadal has a special love affair with Roland Garros as far as Grand Slams are concerned, an entire page in the history of the Monte Carlo Masters, will surely be reserved for the Spaniard; his colossal achievements in the Principality might even qualify him to be called an eternal prince of the Principality. Nadal won eight consecutive titles at Monaco from 2005-2012 and won 46 matches in succession, a record winning streak at any single tournament by any player that will most probably stand the test of time. With the early exits of veterans Marin Cilic and Stan Wawrinka on Tuesday, who could well have been the potential quarterfinalists for Nadal, the draw that seemed a bit daunting at first seems to have eased out ever so slightly. However, the Spaniard still has to combat a couple of tricky opponents right at the start before the action heats up as we approach the business end of the tournament. Nadal is up against an upbeat and resurgent Roberto Bautista Agut in his first match of this year’s clay season. Bautista Agut has been enjoying an incredible run this year with handsome wins over Andy Murray, Cilic and Novak Djokovic to name a few. 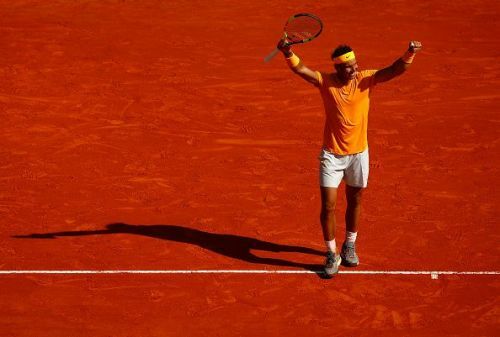 He must be more than eager to transcend his hard-court form into something meaningful on a surface that traditionally favours the Spaniards, the red dirt. The ‘King of clay’ will be completely aware about the potency of his opponent. The Spaniards have squared off against each other just twice, coincidentally on clay on both occasions, with Nadal coming out on top each time. However, Bautista Agut is now a far improved version of himself as compared to the past, and a stern test is on the cards for the World No. 2 right at the start. This is Nadal's comeback match from injury, but we expect him to win this intriguing all-Spanish contest. If Nadal gets past one dangerous opponent, there stands another tricky one in the form of Bulgarian Grigor Dimitrov. Though clay nullifies Dimitrov's strengths, the Bulgarian on his day is capable of vanquishing any opponent. 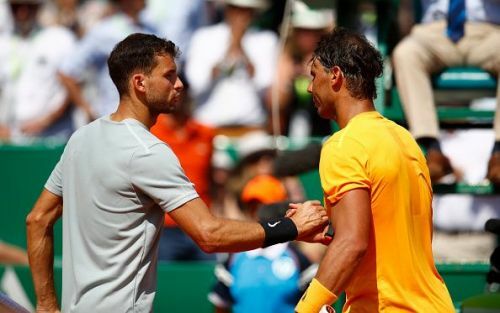 Their 2013 Monte Carlo clash, where Dimitrov pushed Nadal to the limit before the Spaniard came out on top, is a prime example of that; Nadal will definitely not make the mistake of taking him lightly this time around. In what would be a rematch of last year’s semifinal between these two at the same venue, we can expect Nadal to progress to the quarter-finals in straight sets. With the likes of Wawrinka and Cilic both crashing out of the tournament at the hands of lesser known players, Nadal has to face one fewer strong opponent en route his potential 12th title at the Principality. He will now likely face the Italian Marco Cecchinato in the quarter-final, a player who grabbed the attention of the tennis world by defeating Novak Djokovic at last year’s French Open. The two have never met before and that can work in Cecchinato’s favor as the Italian will have nothing to lose. Nadal will have to make a few adjustments to play against a player whom he has never played before. However, Cecchinato doesn't seem to have the weapons to pose a serious threat to the No. 2 seed, and Nadal will probably cruise through this match to register a place in the semifinals. Nadal met Kei Nishikori and Alexander Zverev at last year’s Monte Carlo and Rome finals respectively. While there is no doubt about the ability or skill of either of these two players, both of them have been struggling with poor form and inconsistency in their performances of late. This makes them even more susceptible on clay, especially against an opponent of the highest possible caliber on the surface. Nadal should be able to conquer either of his semi-finalist opponents in three sets. In the final, Nadal would not only have to overcome the skill of the opponent but also probably the mental aspect of his game. He is expected to meet either Dominic Thiem or Novak Djokovic in the summit clash. 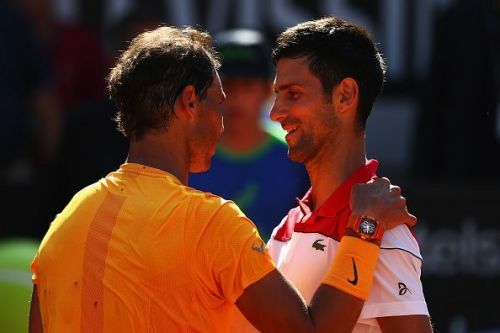 There is no doubt that Nadal is wary of Djokovic, which was very evident even before the match began when these two stalwarts last met, in the Australian Open final. Nadal has to find a way to combat the mental demons that he comes across each time he faces the Serb if the Spaniard wants to bag his 12th Monte Carlo title. With the action returning to clay, history is in favour of Nadal as he finds inner peace on his beloved red dirt. Nadal should be able to draw inspiration from his numerous wins over Djokovic on clay if these two do indeed lock horns for the title clash. Mental toughness would hold the key in the final. As far as Dominic Thiem is concerned, the Austrian remains the only player who has conquered Nadal in the last two seasons on clay. At his full strength, he is capable of winning against Nadal to clinch his first ever Monte Carlo Masters title, but it remains to be seen if he can bring his best on the day. All in all, it would be fascinating to follow Nadal’s journey towards glory at this year’s Monte Carlo Masters, as he navigates one tough opponent after another.